Teyana Taylor and her fiance Cleveland Cavalier guard Iman Shumpert welcomed their first child together, a daughter named Imani Jr. on December 16. I noticed that Taylor was the baddest most fly preggers mama I have ever seen in a long while. 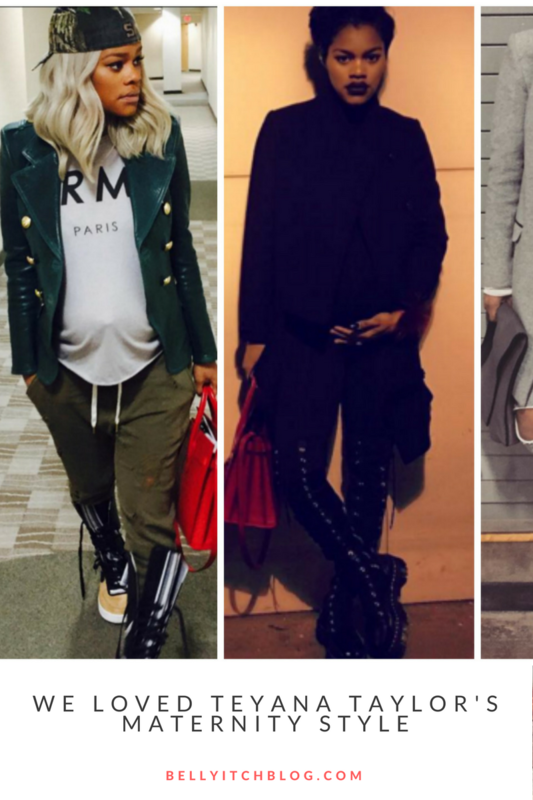 Not since Love & Hip Hop star Rasheeda had another mom-to-be rock chic, eclectic and sporty maternity wear so well. I really dug the military style jacket over a Hermes Paris T-shirt over military style green pants with some funky rubber bottom striped calf-length boots. The R&B singer looked edgy hip Goth/Grunge in all black while rocking some fierce Agyness Deyn Dr. Martin Over-the-Knee Boots. Fab! Finally, the long casual grey sweatshirt material coat jacket, over a tee and sweat pants with ripped knees and high tops accessorized with a dark grey neoprene bad was the business!